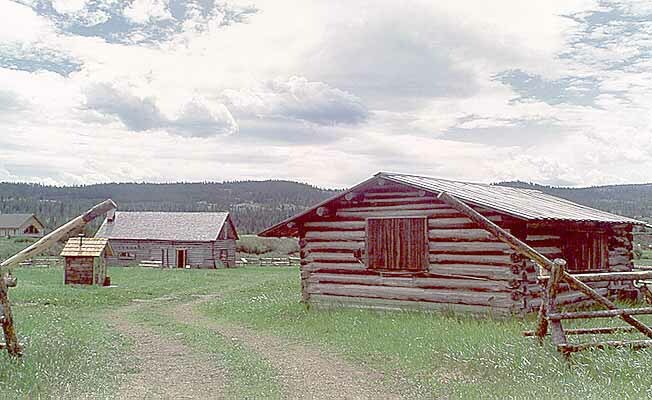 The unique log structures of the Historic Crail Ranch date to the time of the earliest settlers in what is now Big Sky, Montana. The establishment of Yellowstone Park in 1871, and the coming of the railroads to the Bozeman area in the 1880s, gave a strong push to open up the Gallatin Canyon. In the 1880s, the first roads were cut to facilitate logging of pine trees for railroad ties. Ranchers then began moving herds of sheep and cattle up the logging roads in the summer months. By the late 1890s, a few ranchers had begun the process of building cabins and establishing homesteads in the meadow areas of the Canyon. In 1902, Augustus Franklin Crail, along with his wife Sallie and their three children, came up the Gallatin Canyon from Bozeman and established a 160-acre year-round homestead in the Gallatin Basin, now the Meadow Village area of Big Sky. For more than 50 years, the Crail Ranch was an active ranching operation with herds of cattle and sheep, and fields of wheat and hay eventually encompassing 960 acres. Today, the Crail Ranch is operated as a homestead museum under the Big Sky Community Corporation, a 501(c)(3) nonprofit organization. Two of the original log structures have been preserved, along with a collection of historic documents, photographs and artifacts depicting the life of the Crail family during the homestead era. The Historic Crail Ranch is on the National Register of Historic Places. It is open to visitors for guided tours and community events on weekends during July and August.